Discussion in 'PlayStation Vita General Discussion' started by Unknownwolf, Jun 11, 2015. I wanted to create a thread where people can show off their physical collections. This is my collection so far, I got a couple of games coming in the mail. Roscoe Jones, coachjjs75, rajat and 3 others like this. Really nice, starting with the rare stuff I see. 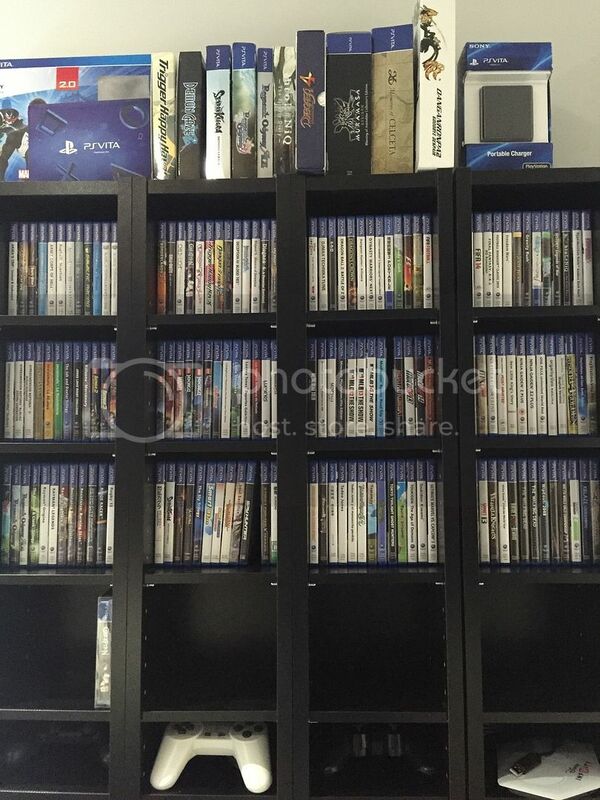 Have you seen the "My games bro" thread that's we're people are posting their collections. I also have been getting REALLY good deals on ebay for the collectors editions to really my collection going. No worries understandable being a newer member, glad you found some good deals. The hyperdimension LE's are nice pieces to your collection and I see your up to date with the Operation Abyss, that game is already not too easy to find! I'm going fully digital with game purchases, so no physical copies for me. It was a tough decision, but the benefits of cross-buy among being able to re-download my games if I ever lose them is too much of a benefit for me to over-look. I just hope PSN never shuts down the service that allows you to download the Vita titles. EckyThump, TEKTORO, Nemo and 3 others like this. coachjjs75, Kalvort, TEKTORO and 1 other person like this. Kenza, Manjoume, coachjjs75 and 15 others like this. coachjjs75, TEKTORO and MrAlsVita like this. Where did you get that gravity rush figure!?? Cool! Play Asia. It was somewhat expensive and customs were bastards about it too. This was my collection back in January 2015. Have bought a huge heap of stuff since so I really should take new photos. I love all these limited editions!!! I want the lego one so bad! And the persona 4 golden one! Unknownwolf and VINNIE GANESH like this. Hehe. That made me laugh! Great collections all! Mine pales in comparison, just got a handful of games at the moment. Murphy or Kyle - is it possible to merge this thread with the existing 'My Games, bro' thread? Hah I'm glad, kinda a spur of the moment thing. Nice collection man. I'm actually going to split them. The My Games, Bro thread is supposed to be for lists, not showing off picture collections - keep going with this thread. Tribal_Renegade, Stryfe and TEKTORO like this. Apologize firstly for I do not have any pictures to post at the moment. I'm in awe with all the pictures you guys posted. @Mr Tornado - The 11th pictures of your post, may I know what game is that on the middle (In between Teraria (JP) and Senran Kagura ~Shinovi Versus~). It pique my interest. Also 1 more thing, Soul Sacrifice....Demo ver...??? The hell is that? It's Hello Kitty to Issyo - Block Crash. 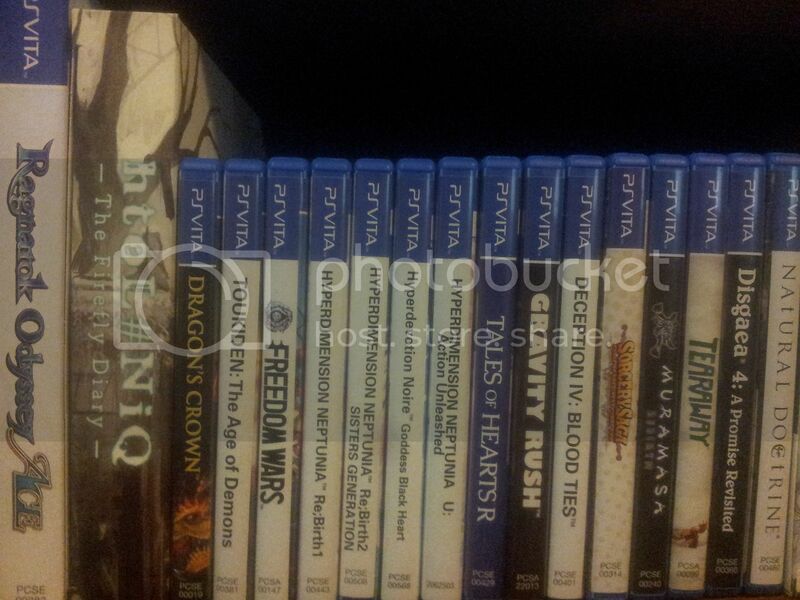 There we go, looks like you find new VITA games with each new day . Thank You very much Kyle for the information. Also 1 more thing, Soul Sacrifice....Demo ver...??? The hell is that? It's a Soul Sacrifice demo, which also has demos for Everybody's Golf & Gravity Daze. coachjjs75, zodaex, Unknownwolf and 8 others like this. I never knew they have demos that comes with retail box...that's pretty neat. (NOT FOR SALE ). @RoboAddy - Woooah your collection shelf is so neat! !